We ran out of leche merengada, so I had to make a snap decision on what dessert to make next. I suggested roasted banana ice cream, but Jeremy shot that down in favor of banana bread. The next suggestion, peanut butter ice cream and chocolate sauce, was heartily condoned, but I didn’t have quite enough half-and-half in the fridge. 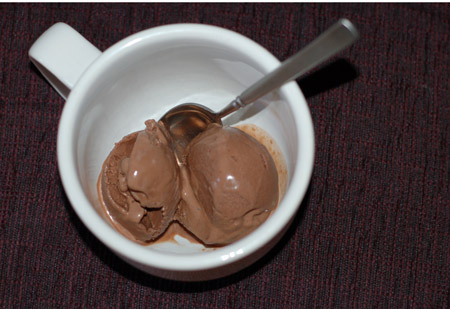 But as I was paging through The Perfect Scoop looking for the latter recipe to see whether I could reduce quantities or even fudge the difference with some whole milk, I happened across the recipe for chocolate peanut butter ice cream. It called for the amount of half-and-half I had, and I could still have some peanut buttery goodness, with the bonus of chocolate mixed right in. It was incredibly easy to make, though we got impatient after an hour or two of waiting for the mixture to chill. It was still lukewarm at that point, so I surrounded the bowl with an ice bath, and we hung around anxiously for another half hour, then gave in and churned it up. I used natural peanut butter and Droste cocoa, and we ended up with a rich, smooth ice cream with a perfect balance between the two flavors. Jeremy’s only complaint was that I didn’t make enough!